Do you have the mind of a 20yr old or of an 80yr old? Give your brain a workout by solving simple problems and exercises quickly! Once your brain is warmed up and blood is flowing in there, do a brain age check to see how you’re faring. Sudoku lovers may want to pick up this game for the Sudoku puzzles alone. 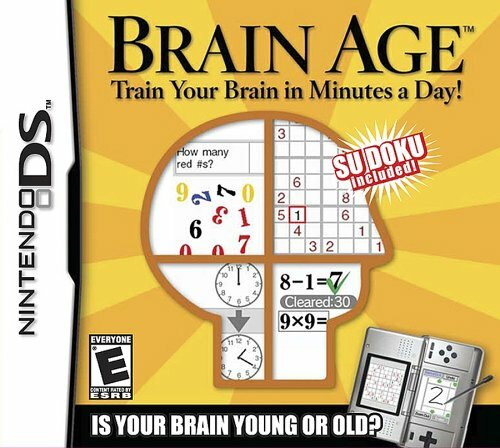 There is a quick play mode, which will allow anyone to do a quick training, brain age check or a Sudoku puzzle without affecting your profile. With your personalized profile your high scores, drawings and charts of progress are kept. If there are multiple profiles you can compare scores and drawings. How do I train my brain? The game starts out with 3 training modes: Calculations X20, CalculationsX100 and Reading Aloud. After you play for a few days you will unlock Low to High, Syllable Count, Head Count, Triangle Math, Time Lapse, and Voice Calculation. You can also unlock hard modes for Calculations X100, Head Count, and Triangle Math. When it comes to training your brain there are three different exercises chosen at random or you can choose your three with a secret in the game. These are the exercises: Word Memory, Stroop Test, Speed Counting, Connect Maze, Number Cruncher, and Calculations X20. Here is a break down of each puzzle. Calculations: Simple addition, subtraction, multiplication. Try to do the problems as fast as possible. Hard mode adds division. Reading Aloud: Self-explanatory, it gives a snippet of famous literature and will calculate how many syllables per second you can read. Low to High: Numbers will flash for a short moment and you have to place them in order of low to high based on your memory. Syllable Count: Count how many syllables are in the phrases displayed. Head Count: Keep track of how many people are in the house as people are coming and going. Hard mode has people entering/exiting from the chimney too! Triangle Math: Add/Subtract from the top row and carry the two totals and add/subtract those. Hard mode adds another row. Time Lapse: Calculate how much time has passed from the different analog clocks. Voice Calculation: Same math as Calculations X20, but here you speak your answers instead of writing them down. Word Memory: Look at 30 words for 3 minutes and see how may you be able to remember within 2 minutes. Stroop Test: Say the color of the word not what the word says. Speed Counting: Count to 120 as fast as you can. Connect Maze: Connect A:1, B:2 etc up until M:13. Number Cruncher, Answer questions based on the displayed numbers; an example might be how many of various types of numbers there are, etc. This game can recognize handwriting and voice. It does a better job at hand writing recognition in my opinion. The voice recognition is decent but I had trouble with it recognizing the word Blue and the number Six. I’m from the Midwest so I don’t have a strong accent and I tried various voice tones with no guaranteed success. The graphics in this game are very simple but you don’t need 3D rendering with this sort of game. The sound effects are decent; nothing fancy is needed here either. This game is completely clean. It’s a fun title that I would recommend for anyone. Some of the phrases in the Syllable count come from the Bible as there are a few famous proverbs quoted. This game will make you want to keep coming back. You can chart your progress and get your brain up to snuff. If you get a bad brain age score you’ll have to try and improve it the following day. The professor is likeable and may even joke around with you a little. He’s given me a brain age score of 71 by mistake and then gave me my 26 I deserved. I haven’t gotten a perfect 20 yet.